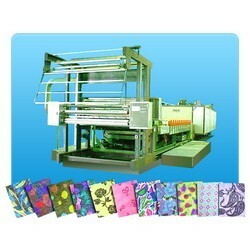 Ming Yng Machinery Works Co., Ltd.
Screen Printing Machine, Textile Screen Printing Machine, Textile Machinery. MY-120 IS A DURABLE, STURDY AND PRECISION PRINTING MACHINE. * BEST FOR ALL KINDS OF KDITTED WOVEN OF NATRAL, SYNTHETIC OR BLENDED FIBRES. * SMOOTH AND EXPEDITIONS PROCESS. * PRECISION PRINTING AT ANY SPEED. * THE BEST PRINTING RESULT. ALL PRINTING ROLLERS ARE STAINLESS STEEL MATERIAL TO SUPPORT THE PRINTING BLANKET WHICH MAKE THE PRINTING PROCESS IN SMOOTHLY AND NOISELESS CONDITIONS. THE CONTINUOUS PRINTING SPEEDS FROM 10-70M PER MINUTE. THE SCREEN DRIVING SHAFT IS LINKED WITH THE BLANKET DRIVING SHAFT BY A CLUTCH SET. THE PRINTING SUPPORT ROLLER WILL DROP IN LOW POSITION. THEN. THE BLANKET DRIVING SHAFT WILL AUTOMATICALLY STOP AND THE SCREEN DRIVING SHAFT IN FREE ROTATION. IT IS ABLE TO CHANGE AND CORRECT THE COLORS SIMULTANEOUSLY, THIS SPECIAL DESIGN FOR REPRINTING PURPOSE. THE COLORS WILL BE EXACTLY MATCHED TO ORIGINAL CONFIGURATION.